Plot: Two would-be rockers from San Dimas, California, are once told they'd save the universe during a time-traveling adventure, but find themselves as middle-aged dads still trying to crank out a hit song and fulfill their destiny. Out of luck and inspiration, Bill and Ted set out on another time travel adventure to seek the song that will set their world right and bring harmony in the universe as we know it. Bill and Ted 3 rumblings have been bouncing around Hollywood for seemingly ages. The original's writers Chris Matheson and Ed Solomon, as well as stars Keanu Reeves and Alex Winter, have all been quoted as being interested in continuing the franchise and doing whatever it takes to ensure that happens. Within the past year, rumors of Bill and Ted going on a third excellent adventure have been heating up. Reeves was quoted last September as saying Matheson and Solomon planned to take a stab at a script, and Winter stated the third adventure would not be "bogus" as if its arrival was inevitable. The latest updated on Bill and Ted 3 circles back to Reeves whose post-Bill and Ted stardom from The Matrix and Speed would help sell another rad adventure. In speaking with MTV on April 4, 2011, Reeves said the writers are only six weeks away from delivering a first draft of a Bill and Ted 3 script. Reeves went on to talk about the plot of Bill and Ted 3 revolving around the dufus duo and the Wyld Stallyns' becoming obsessed with writing the ultimate song that will save the world, something they never quite accomplished in the previous films. There would be a time travel element back to some point in the past as well, but then Reeves cut himself off before divulging one too many details and incurring the wrath of his writing team. Sadly, George Carlin, who portrayed Rufus in the first two films, passed away in 2008. The passing of Rufus in the third film could figure into Bill and Ted pushing so hard to live up to the hype their teacher showered them with. I know this has been on the cards for a long time. I'm a huge huge fan of the first two movies and have been wanting the third movie for a LOOOOONG time! Pretty much everyone is on board for it, they just need the financing. Same mate... loved both movies as a kid and still do to this day, of course. I hardly ever agree with them resurrecting old comedies (Dumb & Dumber and Zoolander for example), but I'd be well up for a Bill & Ted 3! MGM Studios have greenlight a third Bill & Ted's film titled Bill & Ted Face The Music with Keanu Reeves and Alex Winter reprising their iconic roles, according to The Hollywood Reporter. Galaxy Quest director Dean Parisot has signed on to the film, along with screenwriters Chris Matheson and Ed Solomon. "...Bill & Ted Face the Music will see the duo long past their days as time-traveling teenagers and now weighed down by middle age and the responsibilities of family," reads THR's description of the film. "They’ve written thousands of tunes, but they have yet to write a good one, much less the greatest song ever written. With the fabric of time and space tearing around them, a visitor from the future warns our heroes that only their song can save life as we know it. "Out of luck and fresh out of inspiration, Bill and Ted set out on a time travel adventure to seek the song that will set their world right and bring harmony in the universe as we know it. Together with the aid of their daughters, a new crop of historical figures, and some sympathetic music legends, they find much, much more than just a song." 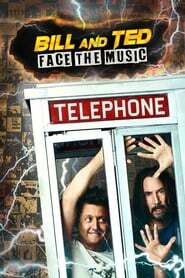 A release date for Bill & Ted Face The Music has not been announced. Nooooo Waaay! This is most triumphant news! Love it that their coming back with a third installment. Now if only a studio would green light the film. If not, its just dust in the wind dude. Think you must've missed Tridon's post above dude... MGM have greenlit the film. A bunch of United Airlines passengers had one excellent journey to Los Angeles, in spite of their plane making an emergency landing. Keanu Reeves was on a flight from San Francisco to Burbank when the flight was forced to redirect to Bakersfield, according to the actor’s fellow passengers who documented the trip on social media. The craft landed safely with no injuries, though it seemed faster to take a van the remainder of the way back to L.A. So the John Wick star ended up road-tripping with a group of his fellow travelers. “That time when your flight out from [San Francisco’s Game Development Conference] almost crashes and you have to emergency land in a remote airport but at least Keanu Reeves is having as bad a day as you are,” Twitter user Amir Blum, a passenger on the flight, wrote of a photo of him and Reeves. A rep for SkyWest did not immediately respond to EW’s request for comment. Additional video taken by Reeves’ travel buddies, including L.A. freelance artist Brian Rea, showed the Bakersfield airport devoid of attendants, though the Blimpies opened up for them. Reeves was shown stepping up to figure out travel arrangements. According to the batch of social media posts churning out from this moment, once the actor boarded the van, the 54-year-old entertained the riders by sharing factoids about Bakersfield and using his phone and YouTube to play native Bakersfield music. In summation, Reeves seems like the ultimate road trip buddy.